If you’re in the Tampa area and are a wildlife lover, this 3-hour motorcycle ride to Manatee Viewing Center is for you. Hop on a motorcycle, and take off for a ride over to Apollo Beach. Once you arrive at the Manatee Viewing Center, enjoy about two hours of free time strolling the boardwalk and snapping pictures of the creatures in their natural habitat. You can also pop into the museum or gift shop before you cruise back to Tampa. Meet your guide at the tour operator’s home base near the Port of Tampa a little before the departure time you chose. There is an option for a 9am and a 1pm departure. Once you meet your guide, he or she gets you set up with a helmet for the ride, and then it’s time to go. 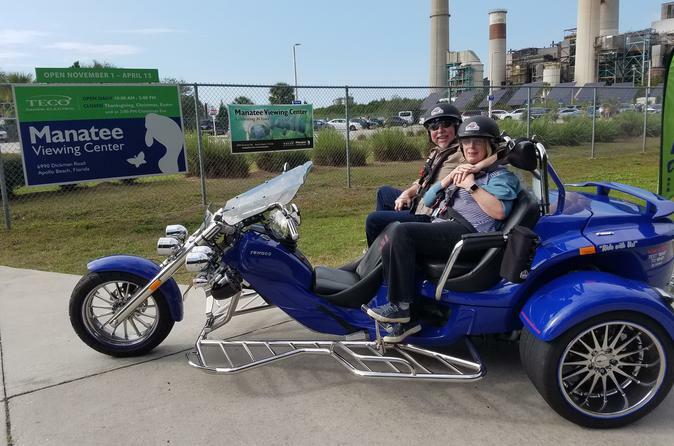 Cruise on the motorcycle down the Lee Roy Selmon Crosstown Expressway for about 30 minutes or less until you reach the Manatee Viewing Center in Apollo Beach. Here you will have about two hours to wander and explore. Take a stroll on the boardwalk, and catch views of adorable manatees in their natural habitat. You can also go through the center’s museum to learn more about the center’s wildlife. If you’re interested in picking up some souvenirs from your trip (own expense) then head over the gift shop. After your time at the center comes to an end, your guide takes you back to Tampa the way you came on motorcycle.